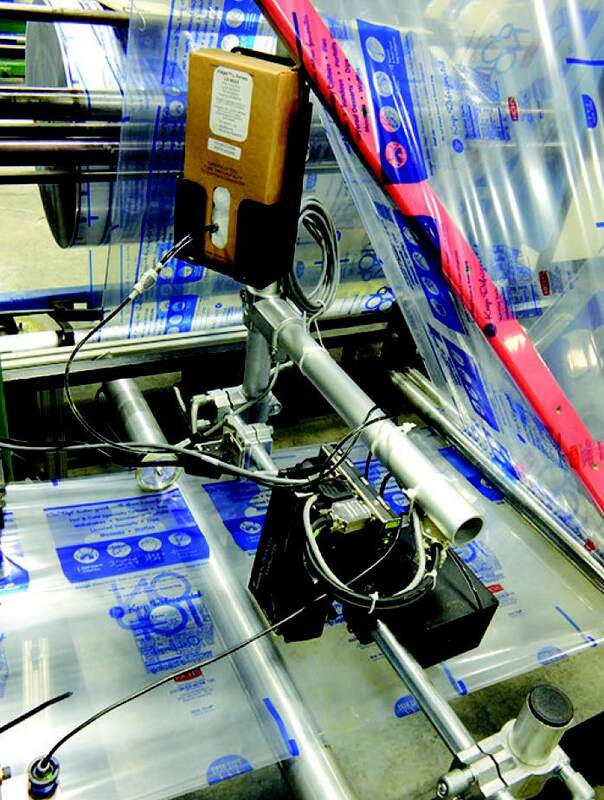 To better support a customer’s needs for track-and-trace serialization, flexographic printer and packaging converter Bison Bag looked for a direct primary packaging marking solution that could accommodate intermittent runs and manage associated data. Matthews Marking Solutions implemented a low-maintenance thermal inkjet printer with cartridge-based bulk ink supply, controlled by the MPERIA® platform for single point message creation, system control and future connectivity to Bison Bag’s ERP system. Matthews recommended replacing the CIJ systems with five easy-to-use VIAjet™ L-Series thermal inkjet (TIJ) L12 0.5-inch tall printheads equipped with a bulk-based ink supply on each production line. Cartridge-based and fed by the Active Bulk Ink Supply (ABIS) delivery system in 1-liter increments, the printers mark variable data at a higher printing resolution (600 x 600 dots per inch) than CIJ printers for maximum clarity. All of the VIAjet™ L-Series printers are managed and controlled by MPERIA®, Matthews’ marking and coding automation platform. This allows the messaging for each printer to be changed from a single location via a 12-inch touchscreen graphical user interface (GUI). MPERIA® allows marking in multiple languages; messages can be created, selected and printed without requiring any special operator training. Further, MPERIA® supports any future expansions, easily controlling and managing the addition of more printheads or production lines as needed. With the new Matthews’ MPERIA®-driven VIAjet™ L-Series TIJ system, Bison Bag can now provide individual product serialization, supporting the customer’s need for track and trace should an issue arise. Unused inventory and product in the field can be quickly identified and isolated, saving time and money, as well as minimizing rework and limiting the numbers of products recalled to the hundreds instead of potentially tens of thousands. Further, with the high-volume ABIS delivery system the VIAjet™ L-Series printer’s only maintenance requirements are a routine bulk ink cartridge and bottle replacement to refill the ink supply (a process that takes approximately 30 seconds) and an occasional cleaning. The 1-liter ABIS delivers a print capacity of 3.6 million impressions prior to replacement, yielding an estimated 20% decrease in Bison Bag’s consumables costs. In addition to significantly reducing daily upkeep costs, they no longer needed a maintenance contract in support of the printers, saving them an additional $5,000 annually. For long weekends or intermittent printing windows, the L-Series print cartridge is outfitted with an air-tight cap that seals off the print engine to protect against drying out and contamination. Because all the VIAjet™ L-Series printers are managed and controlled by MPERIA®, Bison Bag shift supervisors now utilize a single centralized position to drive all five production lines simultaneously. Each has access to set the lot code for each bag-making machine locally or through a virtual network computing (VNC) that allows remote replication of the controller on wireless tablets or phones. Supervisors can change, edit or display what is printing on each line from their remote devices. The next step for Bison Bag is to integrate MPERIA® with their enterprise resource planning (ERP) system for automatic population of all data needed in the mark (lot code, machine number and date). This would allow shift supervisors to simply select a message instead of building it for each production order.